As they grew old, and faced their deaths, most of what had happened in the decades since their war seemed to recede, fade, lose shape and colour -- and the hard kernels of dastardly memory grounded in those intense weeks and months in Europe was all that remained. I grew up in Montreal in what felt like the shadow of the World Wars. There were soldier ghosts everywhere: in the dining hall at my school, Lower Canada College, fading sepia-tinted photos of Old Boys killed in World War I. In the school's Memorial Gymnasium, bronze tablets with long lists of names. 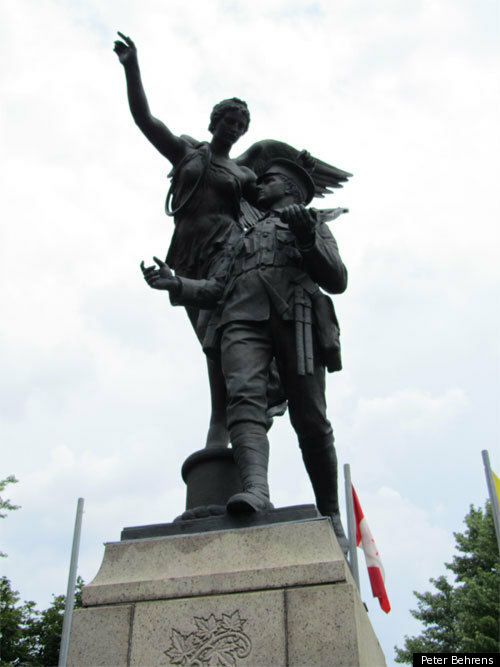 And in the heart of our neighbourhood, there was the Westmount Cenotaph: slabs of stone with names engraved and a powerful, weird bronze soldier marching off to battle with an enormous bronze angel hovering at his shoulder, pointing the way -- toward what, exactly? The sound of the guns? Victory? Death? All the above? My uncle John J.K. O'Brien, was one of the names on the "1939-45" slab, along with dozens of other Westmount "boys." They were always referred to as "boys," "the boys," because that was how my mother and aunts and other adults who had grown up in the neighbourhood remembered them: boys playing hockey on the rink in Murray Park; boys hanging out at Macy's Drugstore after school; boys going "overseas;" boys not coming home. So we wore the blood-red plastic poppies pinned to our lapels in November and we "remembered" what I actually did not, could not, remember, since I was born 10 years after the end of WWII. Now, when I come back to Canada on this endless book tour, I am glad to see the poppies are still worn. Last week when I returned home to Maine for a few days I brought a poppy for my five-year-old to wear; and one for his Westmount-born kindergarden teacher at the Waldorf/hippy school in Blue Hill, Maine; and one for me. I know the symbol and the day has had a different resonance in Canada, since Afghanistan. 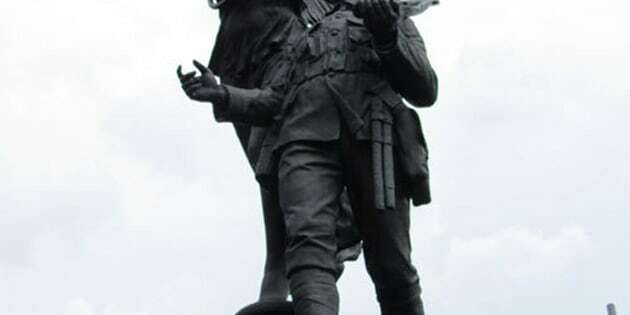 We must hate the wars, but part of hating them surely means refusing to forget them. Last night in Vancouver, as guest of a readers' club, I read a piece from my new novel The O'Briens. The bit I read was a "letter," written by a young Canadian infantry officer, in the regiment 22ième, who has just been through his first experience of battle (in Sicily, in 1943). He writes to his young wife, back in Montreal. He does not have the language to desribe what he is feeling so his letter is a raw and incoherent but I hope it has some authenticity. When I composed the fictional "letter" I tried to infuse it with everything unspoken by my family about their experience of the wars. My uncles were silent Canadian officers and gentlemen of the pre-psychologial generation. They were not comfortable "sharing" their "feelings." They were not Oprah Winfrey people (and more power to them!). I find much to admire in their attitude but there was also a price to pay for all that silence about the disorienting experience of modern war. As they grew old, and faced their deaths, most of what had happened in the decades since their war seemed to recede, fade, lose shape and colour -- and the hard kernels of dastardly memory grounded in those intense weeks and months in Europe, 1943, 1944, 1945, was all that remained, and were spilled out to me, the inquisitive writer/nephew, not in rehearsed anecdotage but in pellucid shards of raw memory; bits of memory like chunks of hot shrapnel, disconnected to any moral or meaning, scorching and dangerous.